The rumors were true -- Google once again is selling unlocked smartphones on its own, with the Samsung Galaxy Nexus going for $399 in the Google Play Store. 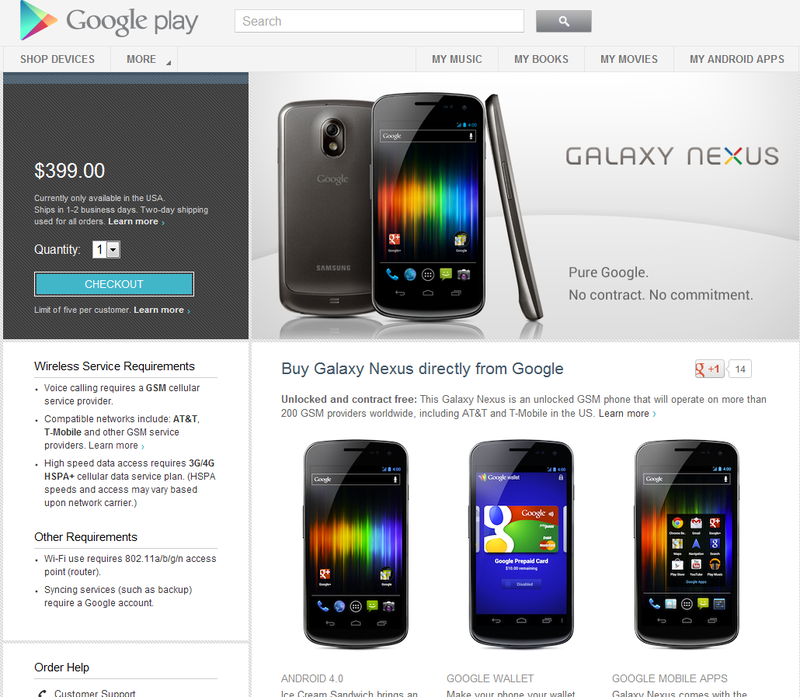 The phone Google's offering is an unlocked pentaband GSM device, same as what many of us had imported previously. The "pentaband" part means that it'll work on AT&T and T-Mobile 3G/4G networks. And because it's unlocked, you can take it out of the country and pop in another carrier's SIM card without needing an unlock code. Google's tried selling phones before, starting with the original Nexus One in early 2010. That ended poorly, with customer support issues dogging Google, HTC and T-Mobile (which at launch was the only carrier to officially support the N1). Google finally shut down the phone store in May 2010 and said the Nexus One would come to retail stores. That didn't happen. Later, the remaining Nexus One stock was offered as a developer device. So what happened? Google's Mario Queiroz told us at Google IO in May 2010 that "The web store as a direct distribution model is really a very small part of the overall Android strategy. With the Nexus One we had the objective of bringing to market a very technologically sophisticated phone, which we did, which really set a new bar for quality. And I think you've seen a lot of the phones in the market today, that have come to market in the past few months, have been influencing, in many ways ... by what the Nexus One was able to do." Sweetening the deal is that Google Wallet -- which for some time has been official only on the Sprint Nexus S, and now on the Sprint Galaxy Nexus -- is preloaded on this GSM device. Devices in Google Play right now is open only in the U.S. But Andy Rubin, in a blog post this morning, says it'll be coming to more countries. The obvious follow-up question is this, though: Google won't be stopping at selling phones at Google Play, will it?